6x25 Filler Wire. In this construction, there are 19 main wires in each strand, plus six small filler wires. The filler wires are located between the outer layer of 12 wires and the inner layer of six. They provide support and stability to the strand. This construction is the best combination of flexibility and abrasion resistance found in the 6x19 Class. 6x19 Warrington. Each strand is made up of 19 wires. The outer layer of 12 wires has two different sizes of wire; the inner layer of six is one size of wire. The Warrington construction is somewhat less flexible than 6x25 Filler Wire, but more flexible than 6x21 Filler Wire. 6x21 Filler Wire. Each strand is made up of 21 wires. The rope has an outer layer of 10 large wires, an inner layer of five smaller wires and a still smaller center wire. There are five filler wires, located between the outer layer of ten wires and the inner layer of five. The 6x21 Filler Wire ropes are more wear-resistant but less flexible than Warrington, and less abrasion-resistant but more flexible than 6x19 Seale constructions. 6x26 Warrington Seale. This construction is composed of 26-wire strands. It has the same size outer wires as the 6x21 Filler Wire, with an inner wire configuration similar to the 6x36 Class ropes. Thus, it combines the wear resistance of a 6x19 rope with a flexibility between 6x19 and 6x36 Class ropes. 6x19 Seale. This construction has an outer layer of nine large wires, an inner layer of nine smaller wires and a single center wire. The Seale ropes are the least flexible of the 6x19 Class ropes. However, the large outer wires, solidly supported, provide resistance to abrasion and crushing. The 6x36 Class of wire rope is characterized by the relatively large number of wires in each strand. Ropes of this class are more flexible than the 6x19 Class, but their resistance to abrasion is less than the 6x19 Class ropes. The designation 6x36 is only nominal, as is the case with 6x19 Class. Ropes in the 6x36 Class may contain 27 to 49 wires per strand. Improvements in wire rope design, as well as changing machine designs, resulted in the use of strands with widely varying numbers of wires and geometry. Larger wire ropes frequently incorporate a larger number of wires, resulting in a more complex geometry than found in the 6x19 or 6x36 Class wire ropes. WW’s 6x61 Class Bethlehem Mining Ropes generally are designed to comply with ASTM A 1023 geometry, although we added some innovations. WW strands the 6x61 Class Bethlehem Mining Ropes in a single operation, relying on dense, well fitted geometry to provide exceptional rope performance and the flexibility normally associated with 6x61 Class ropes. The 6x61 Class ropes have a Seale-Filler Wire-Seale design, as shown in the cross sections below, containing from 50 to 77 wires per strand. WW further enhances Bethlehem Mining Rope performance by wire metallurgy and wire properties which are selectively modified to augment the specific rope geometries. Many wire rope users have observed that heavily loaded ropes fail internally due to the failure of the IWRC. Such conditions illustrate that heavy IWRC stresses exist, which promote fewer fatigue cycles and create short rope life. WW designed Maxi-core to improve rope life under these conditions. 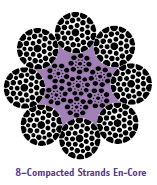 Maxi-core utilizes an IWRC design which features eight strands around a strand center. Maxi-core’s IWRC provides longer life, and, therefore, increases the overall service life of the rope. Because of its specialized IWRC, Maxi-core is resilient and able to accommodate shock loads better than conventional IWRC designs. Maxi-core also adds 33% more core support to the outer strands, thereby reducing internal stresses and promoting longer rope life. As with all Bethlehem Excavator Family Ropes, WW does not publish Maxi-core rope strengths. WW relies on specific rope improvements and specialized features to provide rope designs which give proven, superior field service. 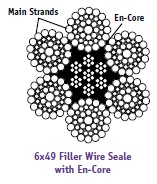 En-core refers to a tough, extruded jacket encapsulating the IWRC and pressure-filling the interstrand spaces. 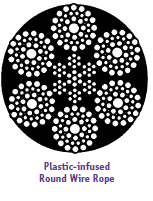 This plastic jacket acts as a cushion or shock absorber between adjacent main strands and at main strand-to-IWRC contact points. The improved internal support is especially significant for ropes subjected to continual bending stresses and fluctuating loads (shock loading). Reduction of wear and damage at internal contact points results in longer and more predictable service life. En-core is available in both Excavator and Excavator-AR grades in diameters 13/4" through 43/4", as shown. Compacted Strands: Beth Pac Beth Pac refers to rope manufactured by compacting each individual strand before closing the rope. In comparison to conventional wire rope, Beth Pac has a higher metallic area, improved crushing resistance and a smoother surface contacting sheaves and drums. Beth Pac is offered in Excavator and Excavator-AR in diameters 21/4" through 23/4" in 8x36 construction for hoist ropes. Beth Pac can be combined with other Bethlehem Mining Rope features, such as En-core. For more information and help in determining your need for Beth Pac and other available sizes, please contact WW’s Sales and Engineering Departments. BXL is furnished as right regular or lang lay, Form-set, IWRC wire rope manufactured in the 6x19, 6x36 and 8x36 Classes. Available grades are Excavator and Excavator-AR. For specific information, please refer to the table. For information on smaller diameters for mining applications, please contact our Customer Service Department. BXL provides the characteristics common to Bethlehem Mining Rope, enhanced by the plastic-infusion. BXL starts with WW’s special wire grades used in the manufacture of mining rope. Excavator grade is designed to provide excellent resistance to bending fatigue, such as those conditions found with hoist ropes. Excavator-AR is intended for those applications where more abrasive operating conditions exist, such as in drag line applications. Enhanced by plastic infusion, BXL offers several improved features. Improved fatigue resistance is one key feature of BXL. BXL’s polymer cushions each wire and strand, minimizing interstrand and interlayer nicking. BXL also offers improved abrasion resistance. The polymer acts as a barrier between the individual strands, preventing penetration of any adverse material, such as dust, dirt and metal particles. The polymer also distributes and reduces contact stresses between the rope and sheave, reducing the wire rope wear normally associated with uncoated wire rope. Perhaps the most important feature of BXL, however, is the polymer’s ability to maintain the balance of the rope. When a rope is in operation, or simply wound upon a drum, the rope’s components move and adjust accordingly. Due to the nature of wire rope, this movement may cause accelerated wear, and in uncoated rope, may also produce a flattening or ovaling of the rope. The polymer in BXL minimizes this movement by locking the individual wires and strands in place. With the rope’s holding its intended shape during operation, operating stresses such as vibration are evenly distributed to all wires and strands, thereby reducing fatigue breaks and increasing service life. This rope is particularly suitable where severe crushing and abrasion on a drum occur, or where a higher strength design is required than can be obtained with a similar round strand rope. The triangular strand shape not only provides better resistance to crushing, but also offers a greater exposed surface area for contact with sheaves, drums or underlying areas of spooled rope. This feature, combined with Lang lay, distributes the abrasive wear over a greater number and longer length of wires. The broad, smooth surface of the rope also helps to minimize wear on drums and sheaves. We make a full line of tail ropes customized to meet your requirements of strength and weight to balance your friction hoist system. Please contact your salesman or customer service with your specifications and we will supply a quotation to meet your needs.